Sovraparco will add vegetation and modern design to an area that has been described as ugly. Architecture holds tremendous power, revitalizing and reshaping a space, or an entire city. Some researchers have even pointed out that the architectural design of a city can directly impact one’s mental health, affecting the quality of life in an area. In short, architecture is here to take complex problems and simplify them into a singular vision, improving human life. Often deriving themselves from mother nature itself, architecture serves to facilitate the basics needs of a person while inspiring and challenging an individual. Francesco Napolitano and his LAD team’s latest architecture project embodies all of this and much more. Dubbed the Sovraparco, and created alongside Hypnos Studio in Milan, the project is a redesign of the gateway of Milan, the famous Piazzale Loreto. The modern redesign brings a modern and inventive lush overpark to the heart of the city, an area that ties together the many threads of the past and the present found in Milan. Today you are not only going to take a behind the scenes look at Sovraparco but gain further insight into Piazzale Loreto. So are you ready? However, Piazzale also has a history that connects it to the rest of the world, marking the place where Benito Mussolini met his end on April 29, 1945. Today Piazzale Loreto is surrounded by some of the most dynamic neighborhoods in the city of Milan. However, the Piazzale Loreto has been described as “rather ugly” by those who have seen it, a place where its aesthetics nowhere matches its historical significance. Without the bounds of a client and without the calls of tenders, Francesco Napolitano and his team are doing what “needs to be done”, creating a heartfelt project with the simple aims of making this public space better, transforming the area with an architectural project. 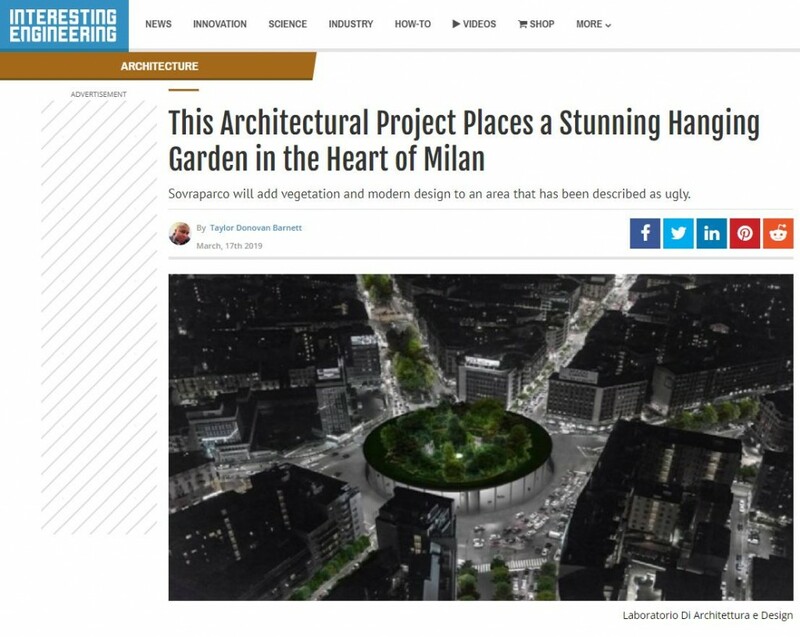 In a city that is eager to create mezzanines across Milan, the Laboratorio Di Architettura e Design team aims to create a hanging garden as part of its urban regeneration strategy. It is not a secret that most of our cities lack ample vegetation. Across the architectural and urban planning realm, there has been a push to build cities that are not only more green but that feature more vegetation, as this can drastically improve the quality of life for residents. The project aesthetically upgrades the area with its hanging gardens, maintaining its historic core shape of the roundabout, connecting the streets that merge at its heart. Described as a planet or desert hosting a green oasis, Sovraparco would be one of the first things visitors see when entering Milan. Think of the Sovrapaco or elevated garden as a floating plaza, a reversed shell that features a wide range of trees and vegetation, adding more color to the rather grey area. Visitors would be able to enter the elevated garden safe from pollution and any traffic noise, similar to other famous elevated parks around the world like the Promenade Plantèe in Paris, Franc or the High Line in New York City. The elevated gardens are broken down into two flat levels, while access to the shell of the building is possible through stairs and an elevator. On the first level of the garden, visitors will find some services and covered spaces as well as an oculus that is opened downwards to the plaza underneath, reversing the spatial logic of the Pantheon in Rome. There is also a ramp that leads to the second level. The second level of the garden is where visitors come to relax, read, organize small events or simply get lost it the small urban forest. LAD and the team took symbolic cues from other prominent places around the world like Corso Buenos Aires. Sovrapaco will bring together various aspects of the city of Milan, taking a city with a rich history and a promising future and putting them on display at the center of the city. Look for the presentation of the Sovraparco during the convention Costruire lo Spazio Pubblico.